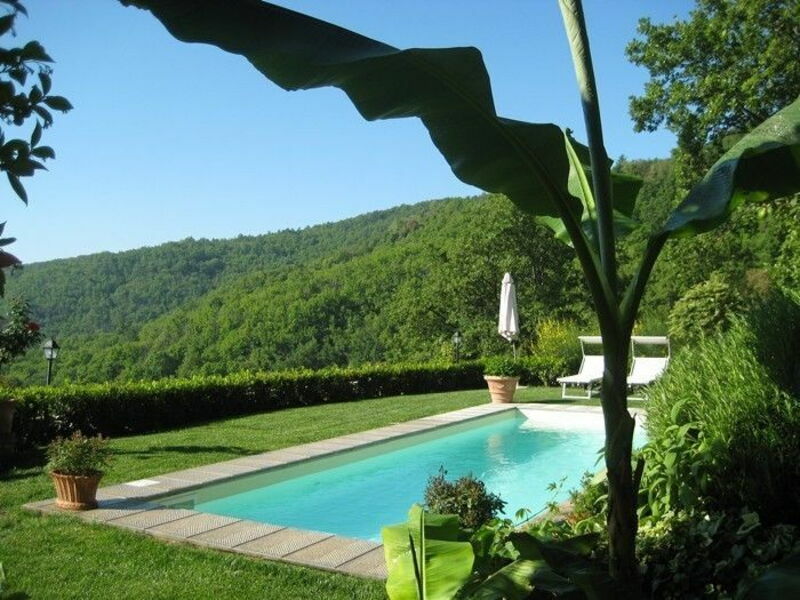 Beautiful house with private pool situated in a quiet and panoramic location over the gentle hills of the Chianti region, near Florence. The villa has been recently and carefully restored and turned into a charming house offering elegantly furnished interiors with beautiful antiques. The location of this property allows to visit Florence which is only 15 km away as well as important Tuscan art cities like Siena, San Gimignano..
Distances: San Donato in Collina with all kinds of shops 2 km away, Florence 15 km away, Figline Valdarno 10 km, Bagno a Ripoli 7 km away. The golf course “Ugolino” is approx. 15 km away. At guests’ disposal: private and equipped garden, private swimming-pool (4 x 8 m – open from 01/05 to 30/09), barbecue. Washing-machine iron facilities available. Extra services to be paid on site: maid service € 20,- / per hour. Professional chef service for dinners at the cost of € 50,- / per person (plus the cost of food shopping). Laundry service (€ 15,- / per hour). Pets are allowed only upon request (to be advised at booking confirmation). Extra services included in the rental price: baby bed on request. 2 towels change, 1 linen change and cleaning service twice a week (2 hours a day). Internet access. Pets are allowed only on request (to be advised at booking confirmation). Villa Anna can be rented together with the property Villa La Vista (a beautiful independent house with private pool) which is situated approx. 50 meters away for a total of 11/12 persons. Ground floor: large living-room (satellite TV) with fireplace, dining-room with fireplace and access to the wonderful covered and equipped terrace (80 m2), kitchen (oven, freezer, dishwasher, American coffee maker, toaster, orange squeezer, microwaves). 1st floor: double bedroom with ensuite bathroom with shower and wardrobe, double bedroom with extra single bed, ensuite bathroom with shower and wardrobe. All of the bedrooms are provided with ceiling fans and all of the windows have mosquito nets.